Perfectly renovated and flawlessly decorated, the Heiser Haus is one of two 1920s “twin” homes that were moved from their original Fredericksburg locations. This gorgeous home has an abundance of historic charm along with all the comfort, elegance and convenience you need. When you drive up to Heiser Haus, you can’t help but feel greeted by it’s cheerful blue exterior and bold orange door. Once inside, you'll feel right at home with hard wood floors throughout and comfortable yet luxurious furnishings. Two large cream sofas are both situated perfectly to enjoy the flat screen TV or electric fireplace. 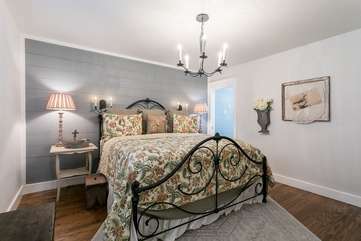 A cozy set of stairs leads you up to the Master Suite where you’ll find a locally hand forged King size bed with well-appointed linens. The en suite bath has both a soaking tub and a walk-in shower and is played up with a crystal chandelier and sconces. The downstairs King sized bedroom and bath are equally magnificent, so no need to argue over which couple gets which suite. Because we know you’ll never want to leave this cozy haven to eat, there is also a fully equipped, modern farm house style kitchen with seating for four. Through the kitchen, you can access your own private backyard where you and your friends can sit and visit around the firepit and each have your own relaxing Adirondack chair. In case you would like to venture out and experience everything Fredericksburg has to offer, Heiser Haus is just a short walk to Main St by way of a foot bridge that’s accessible from the park across the street. AMENITIES - Flat screen cable TV in living room, washer/dryer, WiFi, Electric Fireplace, de-humidifier, backyard seating with firepit wood provided and not to be left unattended), Frantzen Park across the street, walking distance to shops, restaurants, art galleries and festivals. We enjoyed our stay very much. The house was adorable. The beds and linens were lovely and the bathrooms were heavenly! We look forward to our next stay. This place was so charming and cozy. It had all the immenities you could ask for and the bathrooms were fabulous! I loved that the house was decorated for Christmas. I will definitely be back!